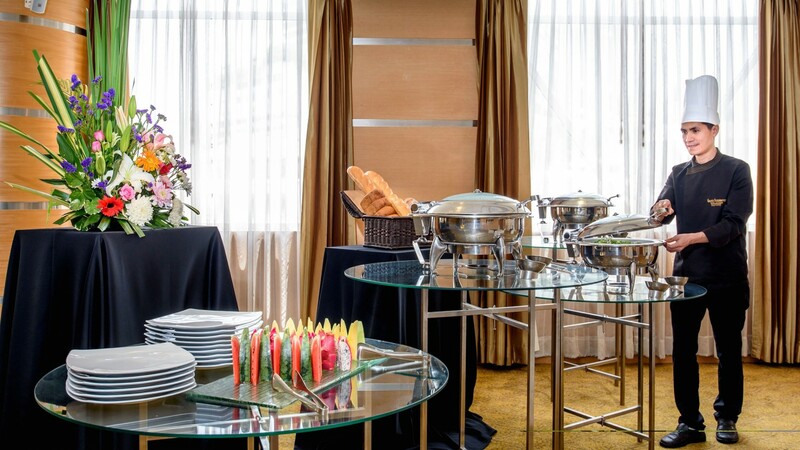 The Grand Sukhumvit Hotel is your ideal party venue in Sukhumvit. Whether you are celebrating a milestone event or just a birthday party gathering with some friends, we are your one stop party solution! Offering stylish and conveniently located party venues for events of any kinds, whether it be business meetings, presentations, seminars, conferences, gala receptions or weddings. Our experience and professional team of event planners ensures any desire parties are smooth-running and remarkable because we know how much this milestone matters to you. Our catering selections provide a wide range of cuisine from local Thai to international flavours. Whether you prefer to have working lunch menu for conferences, plated or buffet choices for your evening gala or cocktails canapes for your wedding receptions or product launches. The Grand Sukhumvit Hotel Bangkok, your ideal party venue perfectly located in Nana, within a walking distance to Nana BTS sky train station. The elevated highway is as well just around the corner, making it convenient for easy access for delegates and guests by car, taxi or BTS sky train. Our team of professionals are here to answer all your inquiries, please call 02-207-9999 or drop us a message.